We made the right decision yesterday to come to this village, it is the most scenic place yet and the real Newfoundland. I also learned that yesterday's weather was a true Northeaster with winds of 35 knots. The claim that this is the Iceberg Capital of the World was fulfilled. It turns out that there are more icebergs here this month than they have seen in years. 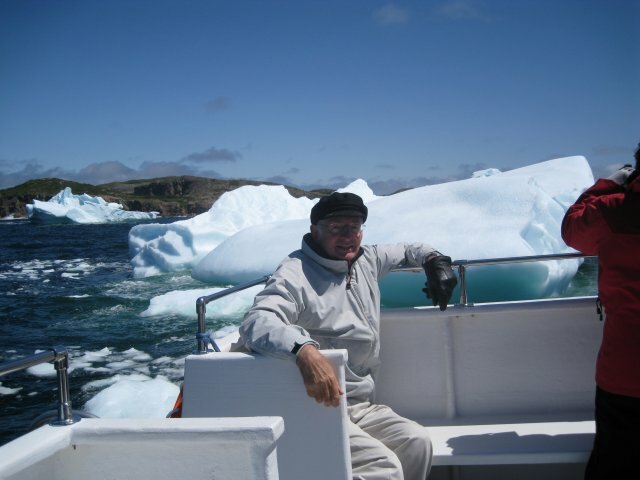 I took the tour boat out to get close (see photo) I took over 100 photos of the icebergs from the boat. There were about 5 large ones. The storm yesterday broke up some of the biggest that were grounded in a cove. On returning from the boat tour we drove to the Durrell Museum which is on a high hill overlooking the harbor. Crowds of people were coming there to see the icebergs (see extra photo). This evening we had fish and chips for dinner (fresh caught cod and home made chips) and saw the Split Pea performance of mostly newfee music. At intermission they serve tea and toutons. Toutons are a kind of fried bread dough with jam.